For several weeks in late July the public corruption trial of impeached Illinois Governor Rod Blagojevich has been going on. No matter how the verdict turns out, the defense strategy has been fascinating. After loudly proclaiming that they would put on a spirited defense and that the former governor would testify in his own behalf, the defense opted not to call a single witness. Their reason, proclaimed in a melodramatic closing argument, came down to the assertion that the prosecution, despite its lengthy and detailed presentation, had not proven its case. I was reminded of a letter to the editor I had written several years ago to the producer of the Law and Order television series, who implied in a Wall Street Journal column that defense attorneys are willing to commit any act, even lie, in order to acquit their "guilty" clients. Television shows and movies dating much earlier than Law and Order have perpetuated this stereotype. What I wrote at the time, and still firmly believe, is that the Constitution of the United States guarantees that all defendants are entitled to a quality defense, not a porous or inadequate defense. Even if the defendant is guilty of the crime charged, he or she is still entitled to quality representation from defense counsel. The system has safeguards. First, professional rules governing attorneys' conduct prevent them from allowing their clients to commit perjury if/when they know the testimony to be false. Second, defense attorneys normally don't argue the innocence of clients, rather they argue, as in Blagojevich's trial, that the prosecution didn't prove their case. The O.J. Simpson case is often cited as an example of someone "guilty" literally getting away with murder. The simple fact is that in reaching its decision the jury believed that the prosecution failed to prove its case as charged. Simpson did not testify; he was not required to testify, any more than the former Illinois governor was. The defense for Simpson or Blagojevich did not have to prove their clients' innocence, only that the prosecution failed to prove its case beyond a reasonable doubt. In any legal proceeding, it is not relevant what the press or public believe. It is not relevant that the defendant has been presented as a "bad" individual (certainly that has been the case with Blagojevich, so far as the late night talk shows have been concerned, for many months). The only relevant issues were those presented in the court of law to the jury by the prosecution and then tested by the cross-examination of the defense attorneys. A verdict of "not guilty" can be equivalent to one of "not proven." That is the safeguard afforded by our Constitution, one that we need to preserve because it is one that benefits all of us. Join me at LawBiz® Forum. 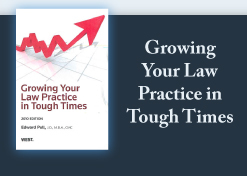 Let's talk about the challenges that face us in the practice of law. The Forum is unique in that we are truly a national community, not bogged down by an electronic water cooler. While a cooler has a place, it is not when and where you're looking for practical answers to immediate challenges. Our Forum community continues to grow. We are here for you. Join us now!